After graduating in 1929, Albini had the opportunity of working with the well known designers Gio Ponti and Emilio Lancia. These mentors played a strong role influencing the young designer to develop an appreciation for combination of traditional craft techniques and modern forms. As his career evolved, Franco Albini became a major figure in the Italian Neo-Rationalist architecture movement. 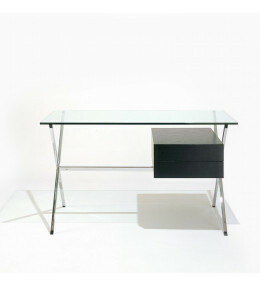 His portfolio is recognised for remarkably transparent furniture designs, featuring basic, near-raw materials. In 1931 Franco Albini founded his own practice in Milan and started to expand his collaborations with manufacturers. During the 1940’s, the architect and designer teamed up with companies such as Knoll and Cassina for the creation of some products. 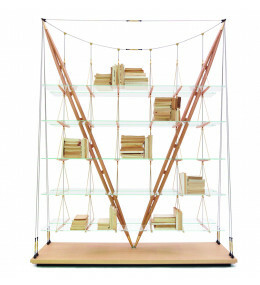 838 Veliero Bookcase has shelves are made of safety glass and two pillars of ash with brass tip ends.